After my previous driving disaster, a friend offers to take me to Braintree, Vermont, where we are joined by the president of the local historical society, who becomes our knowledgeable guide to Silvia’s farm. With anticipation, we follow the old stagecoach route up the hill, stopping briefly to visit the historical society’s collection in the Old Meeting House. Its wide wooden door opens to a spacious room of settled silence. Sunlight streams through leaded windows, alighting with a glow on cast iron kettles, glass oil lamps and galvanized milk cans; the every-day tools held in the hands of people working eighty-four hours a week, fifty-two weeks a year. With renewed respect for living without any semblance of convenience, we return to the road, passing weathered farmhouses companioned by barns. Isolated, they stand among rolling pastures dotted with cows and outlined by woodlands. These are the small hillside farms of Vermont, connected by tradition and the unpaved roads named for families who have lived on the land for generations. Peering from the car window, I trace the outline of Silvia’s gaze in the passing landscape, imagining her first trip up these quiet roads from the busy streets of Manhattan. She has packed the two-room flat on 121st Street: the blue-and-white china brought in crates from Germany, the books and papers and high-heeled shoes. Seven years of memories crowd the backseat as she winds her way up the hillside blanketed in snow. Despite the cold wind blowing across March fields, Silvia rolls down her window, drawing in deep breaths of fresh, crisp air. Turning, she catches the glance of her husband, as her black hair breaks free blowing across her face. Her smile of hopeful promise barely concealed. Spring will come. Greeted by the glow of an autumn afternoon, the three of us step from our car. Our footsteps swish-crick in the rustle of fallen leaves, breaking the silence of bare branches. A crow caws in flight across the open sky of a pasture. The green of its slope rolling toward a broad valley and the languorous curves of the Green Mountains against a backdrop of sky. Five years prior to the purchase of the hillside farm, Silvia writes a short essay, “A Hike to Peace.” With longing, she recalls the five days and nights she spent wandering alone in southern Germany, and the pilgrim’s path she stumbled upon that gave her hope. It was the autumn of 1945. Having escaped the Russian zone, Silvia was living in the American zone in a displaced person’s camp at the Memmingen airport. Conditions were crowded and poor. Few jobs were available and “working for the Germans at that time meant forfeiting all possible future emigration opportunities or possibly even facing forcible repatriation into the communist-dominated area.” Silvia, never one for idleness, attempts to teach English and German, but living in a barracks, with ten other girls of differing temperaments, who tuned the radio loudly to jazz, while entertaining a steady flow of visitors, did not provide an atmosphere for concentration. “It was a gray autumn day,” and Silvia was “lost in gray thoughts of a life without a future and a past of mourning.” Borrowing a rucksack, Silvia packs a worn cotton blanket, eleven useless marks, eight cigarettes, two cakes of soap, two tins of sardines, a couple of cans of evaporated milk and makes pancakes from her share of the pea soup powder. Her sole belongings on her back, she sets off, without a map, seeking nothing more than the quiet solitude found in the meadows and wooded hills. After two days of walking, “meeting, only occasionally, some old women berrying or gathering mushrooms” the distant peaks of the Alps, seem to beckon her. The nights were cold and often without any form of shelter. Silvia supplements her meager rations by foraging for late-apples along the path and drinks water from clear mountain brooks. Wandering alone in nature, she forgets the camp. The “depressing experiences of the past” became “unimportant,” and her “regret and mourning and despair were transformed into an eagerness for a future of duty and responsibility.” For the first time in a long time, she writes of being “happy.” A transformative experience, Silvia draws upon the memory of the hike for years to come, recalling the sights and sounds and scents of the trek to soothe her in times of stress. As I look across Silvia’s hillside with its distant mountain view of “miles and miles of autumn clearness,” her hope for “space and peace” floats softly in the air. She had discovered the place so longed for on new soil. An isolated hillside in nature. A place of peace. A place of belonging. All italicized quotes are from “A Hike to Peace,” by Silvia Narma, 1951. Foods That Will Win the War and How to Cook Them (1918) at Project Guttenberg provides an authentic recipe for Split Pea Pancakes from the First World War. Split pea soup, referred to by some as the “green horror” was often a twice daily meal in many of the DP camps. By following Silvia’s description of the “two-spired church” in “A Hike to Peace,” I tracked her hike to Steingaden Abbey (Welfenmünster) and later to Wies Church (Wieskirche), now a UNESCO World Heritage Center. Here is a rough map of her journey on foot. Informed imagination has been used to write this piece. Silvia may not have driven from the city with her husband, Juhan Umbjärv. Instead, she may have taken the train to the Randolph station in a neighboring town and would not have carried many of her belongings with her. Otherwise, the details have been extracted from the Silvia Narma papers or my interviews. Feature Image: Braintree, Vermont, ca. 1967. 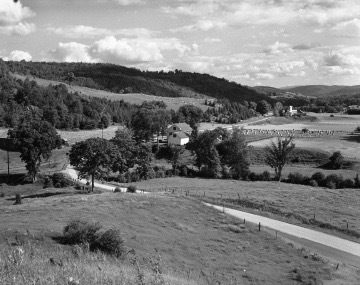 Courtesy of Vermont State Archives and Records Administration, A-082, Agency of Transportation photographs and film. for additional images see the Landscape Change Program. The East Harlem flat (far left) where Silvia and Henrik Visnapuu lived is from the New York Public Library Digital Collection still image collection, 1932. An interactive map with this photograph can be found at Old New York City. An additional image can be found at the New York City Department of Records and Information Services. Search term “block=1786 AND lot=18”. The building no longer stands. Braintree in Snow, ca. 1971. Courtesy of Vermont State Archives and Records Administration, A-082, Agency of Transportation photographs and film. For additional images see the Landscape Change Program. Memmingen Airport Displaced Persons Camp, Germany, ca. 1945. They are used with permission, for educational purposes, by Anita Apinis-Herman, from the Apinis family photographs. An additional image of the camp, taken by Ervins Apinis, can be found at Culture Victoria. Green Mountains photograph, courtesy of L. Talamini. For additional images of the Braintree trip, see the Facebook group, Silvia Narma: My Estonian Neighbor. Follow and Share Silvia's story. Follow Silvia's story as it unfolds, or share the narrative with others.